Cables, cords & wires are needed for any and every electronic to be functional. These cords, cables and wires help power, recharge, and transfer information from one device to another. As newer technologies are progressing to wireless devices there is a lesser need of cords, cables, and wires. Today’s phones, cameras, computers and other device now request information through WiFi, Bluetooth, Z-Wave and other wireless technologies. Some devices can now be recharged through wireless connections eliminating the need for cables and cords. When you recycle electronics you should always be sure to recycle the power cords and cables that came with the devices rather than disposing them in the garbage. They still contain metals that should be recycled. Why should you Recycle your Cables, Cords & Wire? While it may seem that cables, cords and wires are small, they should still be recycled to keep them out of our landfills. They often contain plastics that are harmful to landfills and should be recycled properly. The materials in cables can be recycled to be reused in new products both the plastics and metals. 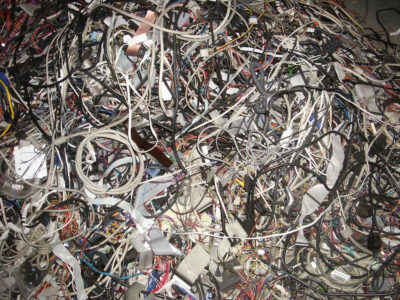 Cables, wires, and cords can be recycled in numerous ways. The best way you can recycle your cables, wires, and cords is by donating them or giving them to someone that will need them. They can also be sold to people that are looking for them. They also can be recycled through separation of metal wires and plastics to be reused in other products. If you have cables, wires, and cords that need to be recycled bring them down to our drop off location at our electronics recycling facility in Santa Ana, CA or call California Electronics Recycler at (800) 282-3927 today. You may be eligible for a free business pickup.